RUSH: It's funny to observe official Washington. You can do that by tuning into any Washington-based media. From day to day, you can see what the narrative, the top narratives are. The soap opera script of the day. It seems today that one of the overriding concerns among the Drive-Bys is the president's relationship with Rod Rosenstein. The debate today centers on whether or not Rosenstein was kidding or not in a meeting with other FBI officials when he suggested wearing a wire the next time he went and talked to the president. What's compounding this or confusing to people is that Trump has not fired Rosenstein. In fact, he had Rosenstein up to the White House and then had him on Air Force One, flew him around and got off the airplane with him. He said they have a good working relationship. The president still will not declassify documents that Devin Nunes and a number of other people want declassified, which would answer a whole bunch of questions about the soft coup and who really started it and when and where and all of that. And the president said, "I talked to Rosenstein -- and I, frankly, told Fox News today in the morning on the phone -- I don't understand why he won't tell people I had a great conversation with him. Some things he told me didn't need to be under oath." 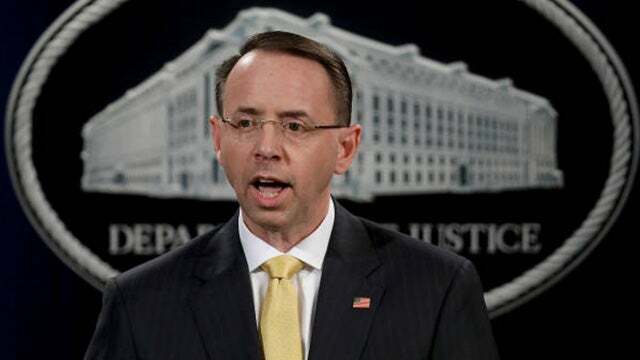 So the Drive-Bys are confused (chuckles) 'cause Trump talked to Rosenstein; Rosenstein told Trump everything he wanted to know. Trump says, "I don't see anything wrong with it." But then Rosenstein won't go up to talk to Congress and Trump's not making him do it! So people can't figure out what's going on. Let me tell you how to observe this or how to deal with it. Trust that Trump knows what he's doing here. That's all I can tell you. Don't fall for the fact that Rosenstein's playing Trump. Trust the fact that Trump knows what he's doing and just be patient.